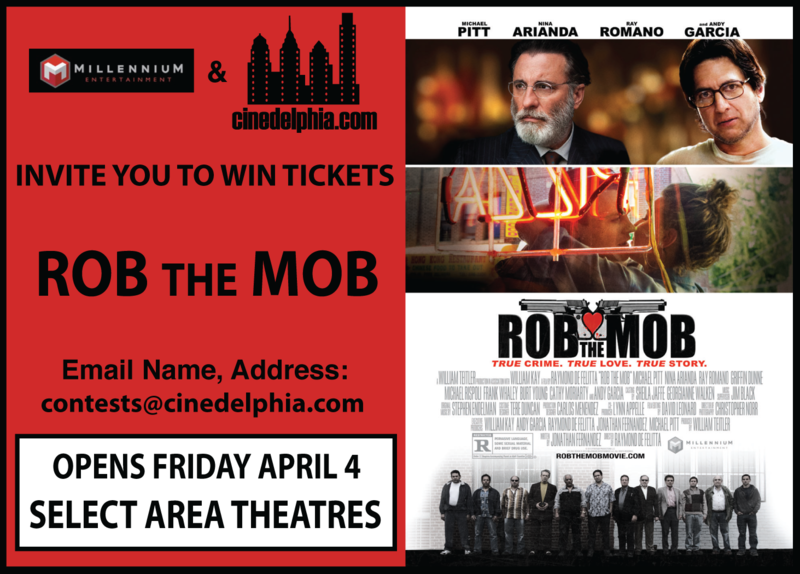 We have a few tickets to see Rob the Mob, opening Friday, April 4. To enter, jus te-mail us with your full name and address, and tell us your favorite mob movie. Winners will be selected at random, one entry per household. Tickets are valid through the film’s run of engagement at the Ritz Bourse. Michael Pitt (“Boardwalk Empire,” Seven Psychopaths), Tony Award® winner Nina Arianda (Midnight in Paris, Broadway’s “Venus in Fur”), Academy Award® nominee Andy Garcia (The Godfather: Part III, Ocean’s Twelve) and Emmy® winner Ray Romano (“Everybody Loves Raymond,” “Parenthood”) star in Rob the Mob, a thrilling and poignant crime-thriller about two lovers whose audacious heists of Mafia social clubs result in a discovery that could forever change the face of organized crime in America. Directed by Oscar® nominee Raymond De Felitta (City Island, Two Family House) and produced by William Teitler (What Maisie Knew, The Polar Express) the film is based on the true story of Thomas and Rosemarie Uva and written by Jonathan Fernandez.